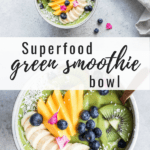 This superfood green smoothie bowl is a simple smoothie recipe loaded with fruits and veggies for a healthy breakfast or snack. Enjoy the goodness of a smoothie that you can eat with a spoon! This post is sponsored by Sunfood superfoods. All views shared in this post are my own. Thank you for supporting the brands that help keep Choosing Chia running! Every Monday I like to start my day off with something green. It’s sort of a ritual after the weekend where it’s easy to indulge. For me, this past weekend was filled with goodies like pizza and wine. 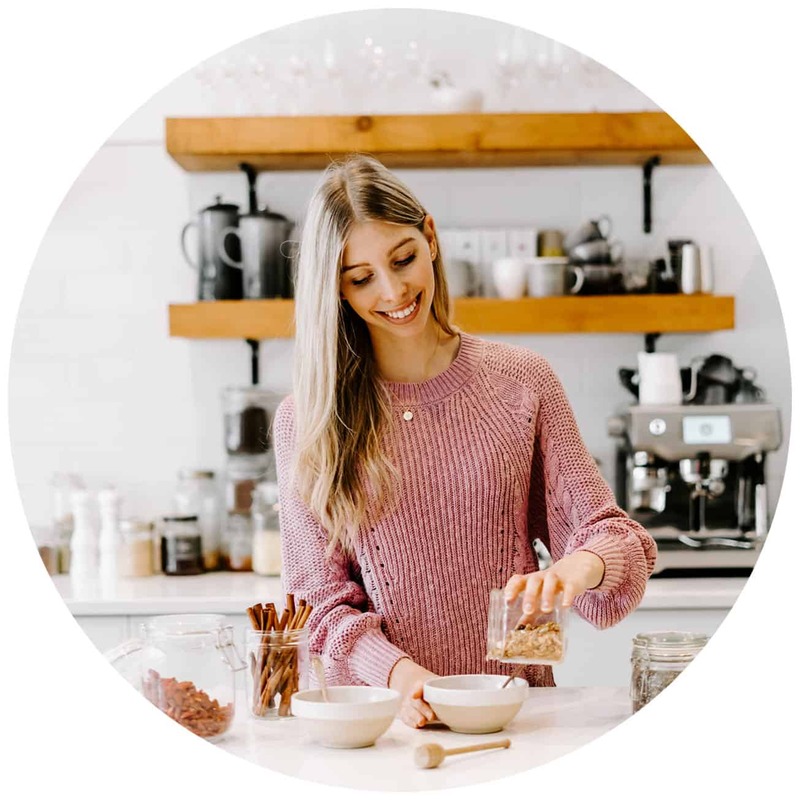 A big part of my food philosophy is all about finding balance in what I eat and never being too strict. I often enjoy saving some more indulgent foods for the weekend and eat a little healither during the weekdays. My Monday morning greens vary week to week, but I often like to enjoy a Matcha tea, a green juice, or a green smoothie of some sort. 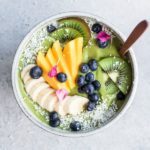 So today I’m sharing one of my favourite recipes for this superfood green smoothie bowl. 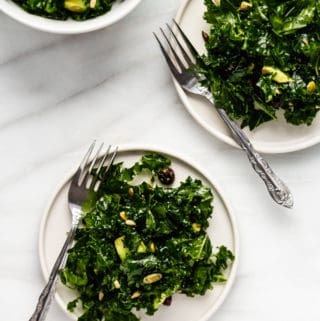 One of my favourite things about adding greens to a smoothie is that its a great way to “sneak” some more veggies into your diet, without feeling like your eating them. (I promise, you won’t even know there are hidden veggies in here!) 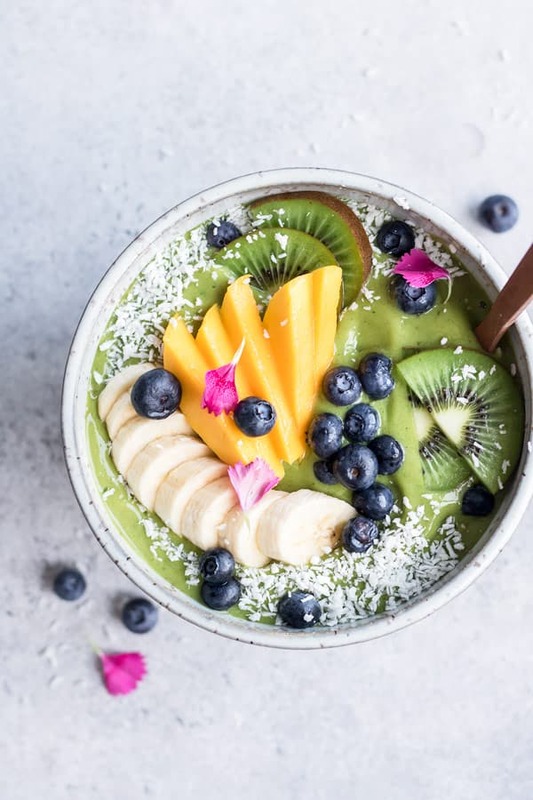 If you’re new to adding veggies to your smoothies or it stills seems a bit odd to you, you may want to try out one of these veggie-packed smoothies for beginners to start turning you on to the idea of it! 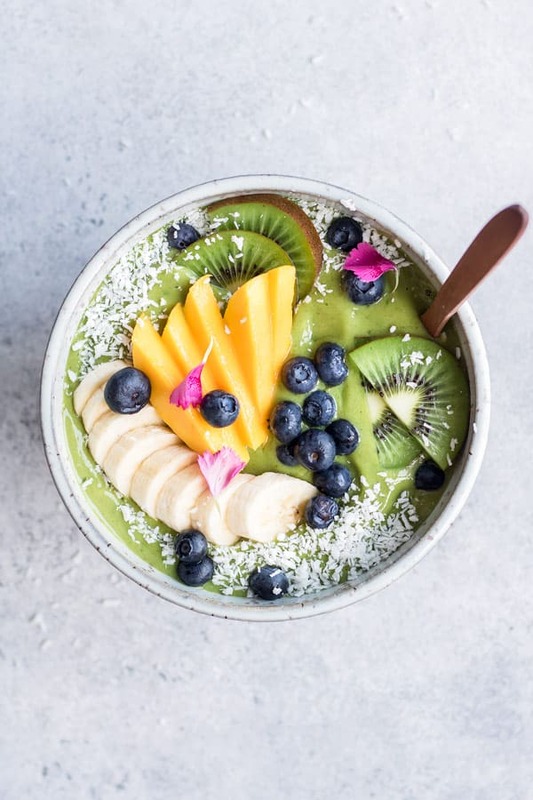 I usually like to add some sort of superfood powders to my smoothie bowls. They’re a great way to add some extra nutrition and vitamins to your smoothies by simply adding a spoon of powder. In this recipe I used Sunfood Sun is shining super greens. 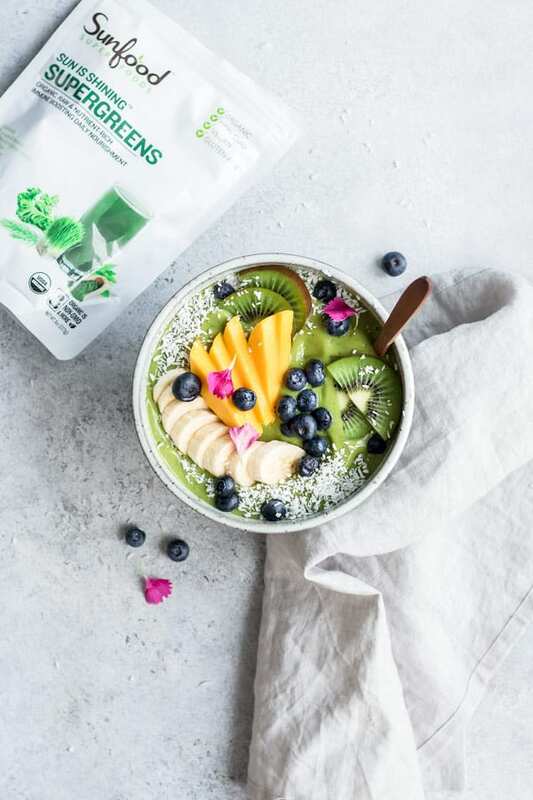 What I love about this specific superfood powder is it has a blend of several different greens, rather than just one. This blend includes ingredients like chlorella, spirulina and wheatgrass. 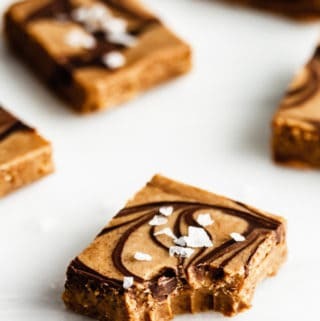 It also provides your daily value of vitamin B12, which is especially great if you follow a vegan diet! 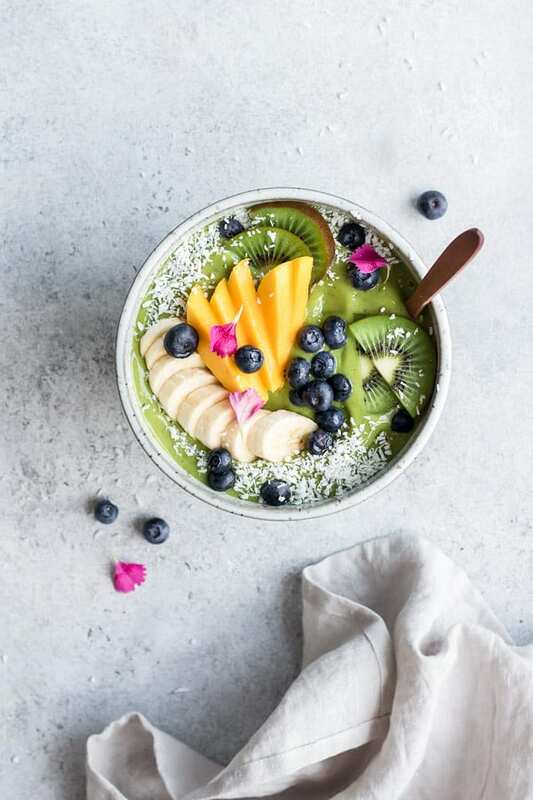 It’s important to use frozen fruit when making a smoothie bowl so the texture comes out thick and creamy like an ice cream. You can either make this bowl using a food processor or a high-speed blender. If using a blender, you’ll want to use a stick attachment to push the fruits and veggies down into the blades. If using a food processor, simply whip the ingredients together, scraping down the sides if needed. I like to top my bowls off with some fresh fruit, shredded coconut or granola, but you can top your bowls off with anything you like! Enjoy this healthy smoothie loaded with superfoods that you can enjoy with a spoon! Add all the ingredients to a food processor or high-speed blender and blend until smooth. The mixture should be thick like ice cream. 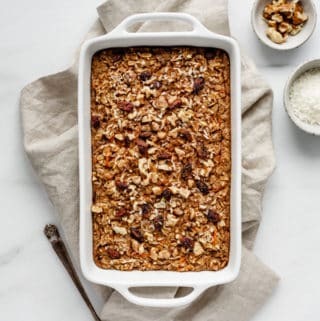 Spoon into a bowl and top with shredded coconut, fruit, or any other of your favourite toppings!